Apple's new IIGS computer is the latestand strongestaddition to the company's "Apple II Forever" campaign. Completely compatible with earlier Apple IIs, the IIGS offers exceptional advances in both graphics and sound (hence, GS). With a new 16-bit microprocessor (see "The Brains Behind the Brains" in this issue), 256K of RAM, and plenty of peripheral ports, the IIGS redefines the Apple II series in some amazing waysand IIe owners can easily upgrade their machines to the IIGS. No wonder it's Apple cofounder Steve Wozniak's favorite machine. Steve's comments accompany this article. It happens whenever a new computer hits the market. In a matter of weeks, sometimes days, you start to hear two criticisms. It doesn't use the latest technology. That means the computer is compatible with earlier, similar machines. You heard this when computers like the Apple IIc, Commodore 128, and IBM PCjr were released. There's no software for the computer. A bit harder to decipher, this means the machine uses some or all of the latest technology. The Macintosh, Commodore Amiga, and Atari ST fit this one. Seems like a no-win situation, doesn't it? It was, until now. Apple's recent announcement of the Apple IIGS, the latest addition to its original line, puts both those criticisms to rest. The IIGS is first and foremost an Apple II, and as such it runs nearly all of the Apple II software on the market today. Yet it's also a new computer that has its own advanced modes of operationsome of which eclipse the Macintosh in performance. In short, the Apple IIGS is two machines in onea product that bridges the gap between the Macintosh and Apple IIe, and in so doing poses what may be a deadly threat to the Commodore Amiga and the Atari ST series. GS stands for Graphics and Soundareas where this computer is most noticeably different from its other Apple II namesakes. Anyone who's worked with the older II-series machines has had to contend with relatively primitive graphics and sound capabilities that are a nostalgic remnant of 1970's technology. For instance, if two areas of the hi-res graphics screen were to be shaded with different colors, you had to be careful that the colors didn't "bleed." This further restricted an already small palette of colors, and made the Apple II pale in comparison to the eight-bit Atari and Commodore computers. The built-in sound of the original II was even worse. There was only a speaker which could be "clicked" on and off by addressing a memory location. That some developers were able to create speech synthesis as well as music through this primitive port is miraculous. More modern designs, like those in the Atari and Commodore machines, provide dedicated sound processors that offer users control over the waveforms and envelopes of multivoice music. In graphics and sound, Apple had a lot to overcome. A Tremendous Choice Of Colors. The gap between the original Apple II and the competition grew wider and wider. Apple, after all, has sold the II in one permutation or another for nearly ten years. The release of the IIGS does nothing to narrow the gapit's just as wide as it ever was. Now, though, it's the competition that's lagging behind Apple. and a 640 X 200-pixel mode that supports 4 colors per scan line. While these modes may not appear to be that much different from the original Apple II hi-res and double-hi-res modes, they are as different as night and day. with existing Apple II software. The difference comes not so much from resolution (although that has improved) as from the fact that the color choices are picked from a palette of 256 hues, each of which has 16 luminance (or brightness) levels. This gives you access to 4096 colors in alla tremendous choice. Apple also announced an analog RGB monitor that shows these colors in their best light. There are no restrictions on color placement. Color bleeding is gone forever. The purity of the IIGS color display has to be seen to be appreciated. Apple chose to use a noninterlaced screen and the resultant picture is very easy on the eyes. One side effect of the 16 luminance levels is the ability of the IIGS to display monochrome pictures with a true grey scale, rather than using halftoning techniques that trade off grey levels for resolution. As a result, digitized photographs look much better on the IIGS screen than they do on the Macintosh, where each pixel is either "on" or "off," black or white. Of course, the independent control of hue and luminance is not new to the personal computer industryAtari was (to my knowledge) the first to introduce this scheme to personal computers. If the IIGS graphics capabilities are good, the machine's sound capabilities are in a class by themselves. Rather than work with the (by now) ho-hum sound chips that provide simple ADSR (Attack, Decay, Sustain, Release) envelopes on sounds made from a small set of basic waveforms, the IIGS uses a custom 32-oscillator chip from Ensoniq similar to the one used in the $1700 Mirage synthesizer. This chip is capable of generating 15 voices of music, allows excellent speech synthesis, accurately reproduces sampled sounds, and is provided with its own 64K of RAM so that music can be played in a background mode while other programs are running. This chip alone justifies the price of the IIGS to many music fans and fanatics. 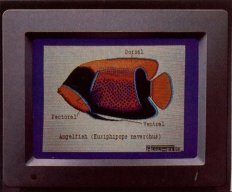 The AppleColor RGB monitor has a 12-inch screen with a resolution of 640 X 200 pixels. 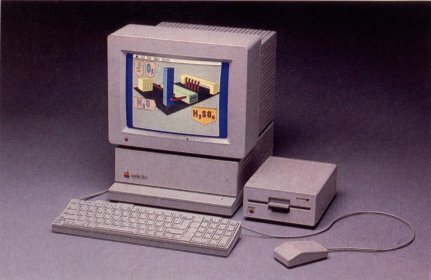 When used with the Apple IIGS computer, the monitor is capable of displaying graphics and text in as many as 4096 colors. All This With A 6502? One of the reasons that the 68000-based computers like the Macintosh, Atari ST, and Amiga have become so popular is because the older eight-bit chips were running out of steamespecially when programmers wanted to create new user interfaces. As a result, IIGS not only runs existing Apple II software, but it is also capable of supporting the various user-interface tools (like menus, windows, and icons) that have made the Macintosh so popular. Lift the hood on the IIGS and you're treated to a view of a circuit board identical in size to the one inside the Apple IIe. This lets Apple offer a special upgrade for IIe owners. For a modest price you can take your IIe to your dealer and upgrade to a IIGS. Only the power supply, case, and keyboard are retainedthe circuit board and basepan are replaced. A closer look at the circuit board reveals a familiar set of seven peripheral card slots that accept the same plug-in cards used by the Apple IIe. But unless you have a lot of old cards lying around, you probably won't have to use any of these slots. That's because the back panel already features a game/joystick port, a disk drive port (which accommodates up to six drives in either the 5.25-inch or 3.5-inch for-mat), two serial ports (including support for the AppleTalk network), composite video out, audio out, and the analog RGB video output. The remaining back panel port is the Apple DeskTop Busup to 16 keyboards and mice may be connected via this bus. (The IIGS is the first computer in the II line to be shipped with a mouse.) Expect to see a lot of interesting peripherals on the market that take advantage of this DeskTop Bus. third-party support for this computer. Several custom chips fill out most of the remaining real estate on the IIGS'S circuit board. One of the most interesting is the "Mega II"a chip effectively duplicating an entire Apple IIe or IIc. Don't be surprised to see this chip used to create a three- or four-chip Apple IIc someday soon. Sound, graphics, and the Apple DeskTop Bus are each controlled with dedicated chips, shifting the burden from the microprocessor. The result is a computer that provides tremendous room for software development. onscreen control panel. Games written for the IIe or IIc will then play at the correct speed.The control panel also lets you set the color of the text and the background, as well as the pitch and volume of the internal "beep." Again, while this kind of control is familiar to owners of Atari and Commodore computers, it's a welcome addition to the Apple II line. At the time of this writing well over one hundred outside developers were actively engaged in creating software for the IIGS. By the time you read this, the number is probably triple that, with new entries being announced every day. Apple itself, however, is conspicuous in its absence from these announcements. The company appears to be content to provide support for outside developers rather than dedicating its resources in aggressively developing its own programs for the IIGS. There's good reason for this approach. Unlike the Macintosha computer released with no immediate third-party software supportthe IIGS runs the vast library of Apple II programs. The IIGS is a machine that you can use from the moment you unpack it and set it up. As new products are developed to take advantage of the IIGS, people will move away from the pure Apple II software and toward the newer titles with their improved performance.